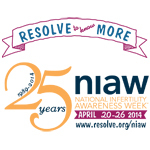 This week is RESOLVE’s National Infertility Awareness Week, and the theme is “Resolve to Know More.” The meaning of resolve is 1) to find an answer to 2) to settle or solve something 3) to reduce by analysis 4) to reach a firm decision about 5) to deal with successfully. Infertility costs. The price infertility charges you will cost you financially, emotionally, and spiritually. No matter how long you have been on this journey of infertility, decide together right now with your spouse to resolve the cost of your infertility. My husband and I were prepared and blessed to pay for fertility treatments without going into debt. It wasn’t our choice to wait nine years for a baby, but since that was how long it took us, our DINK (double income, no kids) status along with my husband’s innate frugal mentality prepared us for this financial obligation. Still, we covered our steps and decisions in prayer and carefully considered the costs of adoption and fertility tests and treatment options. Financial stress is consistently one of the leading causes of marital problems, according to Dave Ramsey’s Financial Peace University. If you become blessed to bring home a baby after the expense of adoption or fertility treatments or both, the actual cost of raising a baby or multiple babies would be additional financial strain. My purpose in sharing this isn’t to advise you to go into debt or not go into debt to have a baby. Having children was very important to us, and now that we are blessed to have one, we can say he was worth every penny. Once we had our son, our finances were a bit more of a strain, as we made the decision that I would be a stay-at-home mom, yet God has provided all of our needs. Couples must still depend on prayer and God’s provision, godly counsel, common sense, and creativity to decide together how to have a baby. Besides prayer, we can go to godly counsel, and for godly financial counsel, one such source would be Dave Ramsey. I have linked a couple of questions people asked him about debt and infertility and his answers. In addition to godly counsel, we should also use common sense and creativity to determine our course of action. When we looked into adoption, we looked at the whole spectrum from international adoption to domestic adoption. Within domestic adoption, we considered relatively cost-free adoptions like DHS or ICW (Indian Child Welfare), to more costly options like an adoption attorney or adoption agency, to a blend of the two such as an adoption outreach that asks for a balance of your time and money. The Adoption Tax Credit can help lessen the financial burden, and some companies provide adoption benefits to employees. When we pursued fertility treatments, we weighed the cost of treatment versus the chance of success. Our employers did not provide medical benefits for fertility treatments, and our state does not have an infertility insurance mandate to provide coverage (only 15 states currently do), but we compared the costs of different specialists in and out-of-state and explored options like shared risk, which is eventually what we settled on. Creatively come up with ways to reduce your current debt and increase your cash flow to fund your fertility expenses before or as they come due. Unless you truly have a care-free attitude about adding to your family, whether it be “Que sera, sera – Whatever will be, will be” or you can leave it all in God’s hands – “If He wants it to happen, He will make it happen”, you will find your infertility journey to be an emotional roller coaster. The emotional cost is really unavoidable, but help is yours for the taking and you are not alone. RESOLVE offers support through its website as well as its presence on social media. This is also a great Fertility Authority link explaining how infertility is not just a disease, but also an emotional experience. I’m even thankful for search engines that allow you type in a phrase or question and find the websites or blogs that provide answers and emotional support. The more we can make people aware of infertility and the effects of it, then hopefully, the understanding and support of your church, family, and friends will help bear the emotional cost of infertility. When we experience infertility and pregnancy loss, naturally, we want to get at the root of the cause, physically. We want to analyze every aspect and gain knowledge from books and blogs to finally seeking out a Reproductive Endocrinologist. Sometimes you may not be able to pinpoint a reason, like endometriosis or PCOS. After all of your tests, your doctor may come back and say you have “unexplained infertility.” Medically speaking, it may be unexplained, but your infertility is not without cause. Resolve to know more about the cost of your infertility, spiritually speaking. Realizing it is for a purpose will help you deal with it successfully. As believers in Jesus Christ, we have to realize, even expect, and God forbid, rejoice, that trials will come into our lives to mold us to be more like Him, to glorify Him, and to encourage others. Our trial of infertility is a test, designed only to try – not to ruin – but to try our character, strength, patience, and trust in God. Our road leading to IVF seemed long. From the first time IVF was recommended as our best chance at pregnancy, it took about 3 ½ years for us to eventually proceed with IVF, mostly because of concerns about the cost. However, with pastoral and godly counsel and much prayer, we felt God’s hand upon us, even guiding us to the center He wanted us to use. This quote describes our road to IVF. After surgery and treatment for Stage IV endometriosis, my doctor’s recommendation was that we try to get pregnant for a year, but if not, she said our best chance for pregnancy was IVF. We were not initially inclined to do IVF. At first, it seemed drastic. If it was still possible to get pregnant within that year, why jump to IVF, when it would cost $10,000 (in 2001) for a 50% chance of pregnancy? This was something we reasoned together but did not try really communicate with our doctor to find out more. The $10,000 would be worth it if I got pregnant, but to spend that much money and not get pregnant with one chance and then be out $10,000 seemed like a huge risk to us. It would have been both financially and emotionally devastating. I didn’t get pregnant on my own that year, and after seeking treatment from a different specialist, we were again advised that IVF was our best chance for pregnancy. At the time, we wanted to try IUI since it did not seem as “invasive” and was also less expensive, although the success rate was not as high as IVF. When IUI didn’t produce a pregnancy, we sought to add to our family through adoption and also started to read a little more about IVF. In the spring of 2004, my sister called me about an episode that aired on Dr. Phil. It was about a shared-risk program for IVF in Washington, D.C. I looked it up on the internet also and found out shared-risk costs more than one traditional IVF cycle, but some programs refund 70-100% of your money, if you do not go home with a live baby after a certain number of attempts. It sounded like something feasible for us, maybe a financial risk worth taking. It is more like a type of insurance, since we did not have insurance coverage for infertility nor live in a state that mandated coverage. That summer the show on Dr. Phil aired again and my mother-in-law taped it for us. After my husband’s talk with Pastor, we watched the program. I looked it up on the internet and tried to figure out how we could make it work. It would be costly just for traveling and lodging. A few days later, I did a web search on shared-risk IVF and a company came up called Integramed (now known as Attain IVF. They did a similar shared-risk program with a handful of approved reproductive centers in the U.S. At the time there were no centers in our state, but the closest one to us “just happened” to be only four hours’ driving distance from where we lived and 5 miles from my sister’s house! That location definitely sounded more practical and feasible. I prayed for peace about this center. We also scheduled an IVF consult with our doctor locally to compare options. I prayed Psalm 102:2b “In the day when I call, answer me speedily.” And He did! Praise the Lord! By the end of October, in one day – the same day – the Lord answered my prayer by closing the door on our local doctor and opening the door to the center out-of-state. Note: I am presenting our story of shared-risk as one of many financial options to have a baby. We had our baby in 2006, and so I am sure there are now even more programs and ways to save money, raise money, get the most out of your money – all that will hopefully lead you on the road to having your baby. When we did not become pregnant on our own, I began to wonder how I, as a Christian, should feel about assisted reproductive technology. I didn’t know much about procedures like AI or IVF, except having developed a few preconceived ideas from a couple of ladies who had experienced infertility and shared their thoughts. Based on that, I wondered if it was even ethical or moral for me as a Christian to pursue. How do I determine what is right or wrong? Were we taking the situation out of God’s hands? These are just a few of the moral issues I needed to discover the answer to. After searching on the internet, I came across the website for the Christian Medical and Dental Association (cmda.org) and found they had published their statements concerning issues and ethics on Reproductive Technology & Health. Even among Christians in the medical field, there was agreement on the biblical principles but not total agreement on the practical application of the principles. Not every technological procedure may be morally justified. This website has proven to be very helpful to me and brings to the forefront the sovereignty of God and the sanctity of life when seeking direction about assisted reproductive technology. I trust it will be a great help to you also. May the words of this beautiful song comfort you as you decide on a path in your journey of infertility. I love the words and hearing my husband sing it (as a solo at our church)! Wondering which road you should take? Where the grace of God can’t keep you. You will never be out of His care. Remember that the Lord’s already there. And see lightning in the sky. Through a still, small voice inside. Oh, He’s the only road you need to take. What lies ahead and what’s behind. The journey of infertility revolves around a lot of waiting, waiting, and more waiting. We can grow impatient. We want to hurry up and get on with the rest of our plans. We beg the Lord to answer our prayers – now! But as J.R. Miller tells us in Streams in the Desert, January 26th, “God often waits for us. While we miss much good through not waiting for God, we also miss much through over-waiting. There are times when our strength is to sit still, but there are also times we need to go forward with a firm step. There are many divine promises which are conditioned upon the beginning of some action on our part.” This is faith in action. We can over-wait by just sitting back and doing nothing. I often thought that option would be easier on me! When I started worrying about the cost of fertility treatments and not knowing if I could go through much more of this emotionally, I just wanted to wait and wish for something to happen. God could have unexpectedly opened my womb, and I did pray for that, however, Jill Baughan recommends in her book, A Hope Deferred, that the infertile couple do something. Have a plan. Do you want to adopt? Find out all you can about adoption. Is it your desire not just to have a baby but also to experience pregnancy? Make a list of your options considering the cause of your infertility, your age, your emotional reserves, and the size of your savings account. Don’t sit at a crossroad. Baughan quoted Merle Bombardieri stating, “the worst thing a couple can do is float into a ‘non-decision,’ where they evolve into child-free living, not by choosing it, but by letting it choose them; or by making a non-decision to agonize, setting no goals.” If you choose not to decide, then you are deciding not to choose. God wants us to move forward. He may lead in different paths, but He doesn’t intend for us to give up. Pray, seek spiritual counsel, and exercise your faith by moving forward. God is waiting to bless.